There is a book (and review) for every season and Adam Fifield’s ‘A Mighty Purpose-How Jim Grant Sold the World on Saving Its Children’ is a perfect match with American Thanksgiving and the end-of-the year season around the corner. The portrait of the influential UNICEF executive director who headed the organization from 1980 until his death 1995 is a fascinating account of personal and political leadership, UN history, global organizational culture and aid policy and practice during the commonly labeled ‘lost decade’ of development. As much as the book (rightly) focuses on the person and inspiring leader Jim Grant, from my academic perspective the book achieves something maybe even bigger: it holds up an intellectual mirror for reflections on our current world, how we can or should be working in ‘development’ and what professional organizations and cultures we (do not) need. The book also expands on a theme that I highlighted in other reviews related to the UN, namely the unique complexity of a bureaucratic system that has relied on individual leadership as much as reinventing rules and being as strong or weak as the ‘international community’ would like it to be. Grant had an old-fashioned, almost priestly bearing. Some were surprised to learn he was nonreligious, because he radiated a messianic zeal-he was, after all, an apostle of sorts, a crusader for children (p.7). Jim Grant was a “cowboy” – a blunt, buoyant, sometimes uncouth, very “American” American. He was a World War II veteran who employed frequent military analogies, drank black coffee out of Styrofoam cups (…) and ate peanut butter and jelly sandwiches his wife had packed for him (p.16). Even if Adam Fifield may not be a ‘neutral’ observer after his six-year employment with the U.S. Fund for UNICEF, he consulted an impressive range of sources, including interviews with close colleagues, life story material, countless official records and personal notebooks (pp.405-406). And these sources help to create a detailed and vivid picture of a visionary, workaholic, mediocre public speaker and flawed manager in a decade when ‘new public management’ gained powerful momentum. Ultimately, his personal and professional traits and weaknesses, his character in general helped to establish an authentic personal brand that delivered time and again: Make the world a better, healthier and more fulfilling place for children. to quickly establish a rapport with people from other cultures was undoubtedly influenced by spending his formative years as a minority resident in a developing country (p.69). (UNICEF’s strengths) was not at headquarters. It was not in its intellectual fecundity. It was in the field. It was in the programs, people, and on-the-ground presence in more than 110 countries. And it was in the good name that had been scrupulously forged over the years in nearly every corner of the world (p.41). In short, his authentic leadership approach met ‘authentic’ challenges of starving children, preventable diseases and many early deaths. Grant wanted to do for child health what Borlaug had done for agriculture. He told attendees (high-level) meeting that a “global movement” was needed to spur a “revolution in child health” (p.55). the premise of GOBI also seemed so naïve, so laughably simplistic. And it seemed to ignore the basic on-the-ground-realities (p.93). No previous executive director had so easily toured the corridors of power or so readily hob-nobbed with presidents and prime ministers. Like him or not, he had propelled UNICEF’s profile to a new level of notoriety. Grant’s whiplash-inducing marketing blitz signaled a monumental shift in UNICEF’s approach: the role of advocacy and communication became central to everything the agency did. After all, this “handful of people with a pocketful of coins” has more than just money and manpower at its disposal-it had influence. It could pressure other entities to spend their money for children. It could prod governments forward. And it could shame those that lagged behind. 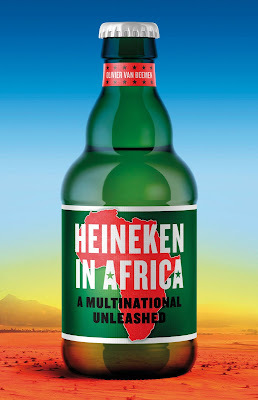 It could be a potent catalyst, a peerless PR machine (p.100). It was probably a rare period in history when Grant’s personality paired with UNICEF’s growing standing delivered the right results for those most in need. If that means working with dictators or autocratic regimes Grant would engage without hesitation, after all the organization was “in the business of making a difference, not making a point” (p.121). After nearly two years of planning, arm-twisting, and behind-the-scenes tussling, (Grant) had pulled it off: the World Summit for Children had finally materialized. (In 1990) a total of seventy-one heads of state had accepted (the invitation), in addition to eighty-eight high-level representatives from other countries (p.289). 25 years later global summit have lost their glamour and probably most of its communicative power as the world is getting ready for the climate summit in Paris at the end of 2015. But getting 3000 journalists and celebrities together with politicians and senior UN bureaucrats into one space lobbying for children must have been a truly remarkable achievement. Remember that this was still a world without Emails, Internet and social media and the entry in the 1992 Guinness Book of World Records for being the “largest meeting of heads of state and heads of government” (p.303) was well deserved. Holding meetings on the weekends. Keeping people in the office until one in the morning (p.8). Several UNICEF veterans have stories of getting a call from Grant, often in the wee hours, when he would share the surprise of a new job halfway around the world – in some cases with only a few days’ notice” (p.192). Even if some UN organizations and their staff work long hours, there is now more awareness about work-life balances and the professional nature of doing ‘a job’; the current debates over sexual harassment in the system or UN peacekeepers’ abuse in missions shed a light on changing human resources and their management. While he did not expressly ask for false figures nor tell people to manipulate information, he doesn’t seem to have actively discouraged it either. Several staff members suggest that he viewed the matter as another pesky distraction he simply chose not to deal with (p.242). in some ways, he was a singularly stellar manager. But when it came to administrative, financial, or personnel issues, he simply wasn’t interested. He didn’t want to deal with it (p.247). You would not be able to head any large aid organization these days and adopt such a cavalier approach to administration and management issue, but with enhanced accountability often come more rules, more procedures and less space for a bold vision that keeps focusing on children. After a mortar attack killed six children in Sarajevo in January 1994, according to AP, (Grant) would lament: “There is nothing to be gained militarily by the killing of babies.” But no one seemed to be listening (p.335). Perhaps the most important result is a radically changed set of expectations-before the MDGs, and before Grant, the world was not keeping track of the fight against poverty with much rigor or precision. (…) By demonstrating the power of measurable, time-bound goals – with clear plans of action to achieve them – Grant changed the modus operandi of the United Nations and numerous organizations and donors now working to enhance global health and development (p.398-399). With the new SDGs in place and critique of the 200 or so indicators to measure their achievement mounting we should remember that Jim Grant embodied and promoted values that have always been bigger than ourselves and that can only be achieved with a unique blend of individual vision and leadership and global cooperation. Adam Fifield’s expose of Jim Grant is a remarkable achievement. It may not provide straightforward ‘answers’ to contemporary development challenges and yet it should be seen as a lighthouse that regularly sends rays of humility and humanity through these dark autumn days. Remembering Jim Grant as that lighthouse keeper hopefully does justice to his life and achievement which Adam Fifield captured diligently. 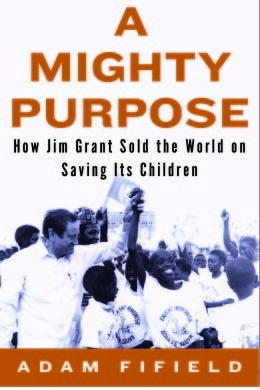 Fifield, Adam: A Mighty Purpose: How Jim Grant Sold the World on Saving Its Children. ISBN 978-1-59051-603-4, 430 pages, USD 27.95, Other Press, New York, NY, 2015. I requested a review copy from Other Press which they kindly provided early in November 2015.